Report on our activities at this Congress here. The activities included a photographic exhibition, with photographs of manuscripts and other materials by Mildred Budny, on “The Integrated Approach to Manuscript Studies”. Its catalogue booklet, by Mildred Budny and Leslie French, can now be downloaded here. The Abstract for this Paper was published in double-column layout in The Old English Newsletter, 27:3 (Spring 1994), A-23, now archived online. The Abstract is republished here, with added links, illustrations, and notes. Photography is widely used for recording the state of a manuscript and making the material more readily available to others. Photographs may reduce the need for handling the manuscript itself, and sometimes they become primary evidence, when the original artifact becomes altered or lost. This paper examines the challenges of manuscript photography to serve a wide range of users. Drawing on my own experience as manuscript scholar and photographer, I survey the applications, formats, materials, equipment, methods, and requirements for manuscript photography, presenting specific techniques, including high-powered microscopic photographs, oblique and transmitted lighting, and ultra-violet and infra-red illumination. Focusing on selected Anglo-Saxon manuscripts (notably Corpus Christi College MSS 12, 23, 44, 173, 183, 197B, 201, 422, and 557), the paper shows examples of problem passages which call for special treatment. Such passages include erasures; palimpsests; burnt portions; liquid damage; passages damaged by the metal mounts of bindings or by chemical reagents in a misguided attempt to enhance faded inks; elements added or altered in different inks; drypoint glosses, notably when entered in superimposed layers; passages affected by corroded pigments or show-through; offsets of ink and pigments from pages now lost; and multiple damage through many means together. The paper reports on our recent Research Group workshop at the Parker Library, which brought together photographic suppliers and manuscript and imaging experts. Advances in photographic materials, equipment, and lighting are described, as well as the important potential they offer for the future. That “recent Research Group workshop at the Parker Library” took place on 15 January 1994. 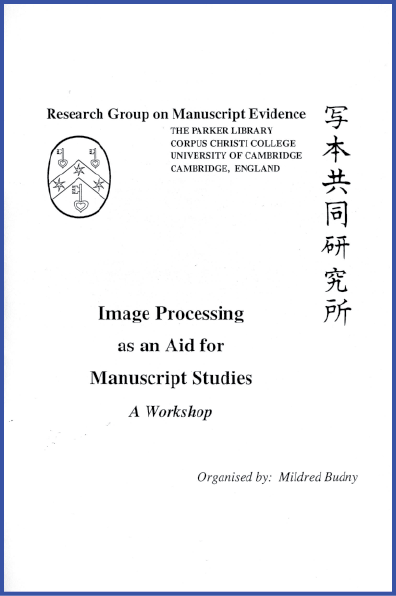 As one of the Series of Seminars or Workshops on “The Evidence of Manuscripts”, the event considered “Image-Processing and Manuscript Studies”. 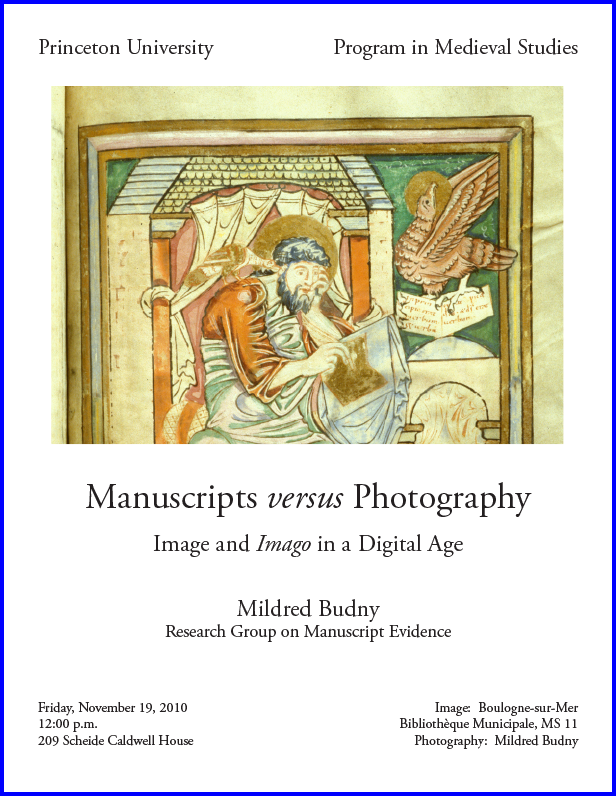 Its 12-page booklet, circulated in print, is now available for download on our website: “Image Processing as an Aid for Manuscript Studies”. 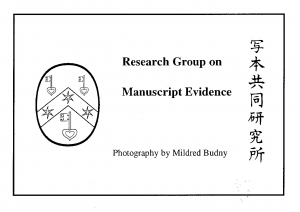 [Notes on the Transcription: The text is here transcribed from the set of 7 pages in the Research Group Archives which present the text of the paper as prepared and delivered at the event. The pages carry single columns of single-spaced paragraphs set in Adobe Garamond, computer-generated in WordPerfect, and printed out on sheets of A4 paper, held together by a metal paperclip. Included in that layout, the symbols “[**]” (circled there in red ink by the author for easier recognition in a darkened room and here shown as “[**]“) indicate the change in tandem of pairs of slides. In those years, slides took the form of 35mm analogue photographic slides mounted for suspension and projection in cassettes. The text mostly identifies the slides. The printout includes a stage-direction in the form of “[SHOW]”. In the context, its intention may be self-explanatory as the cue to hold up a printed photograph placed at hand as a prop. 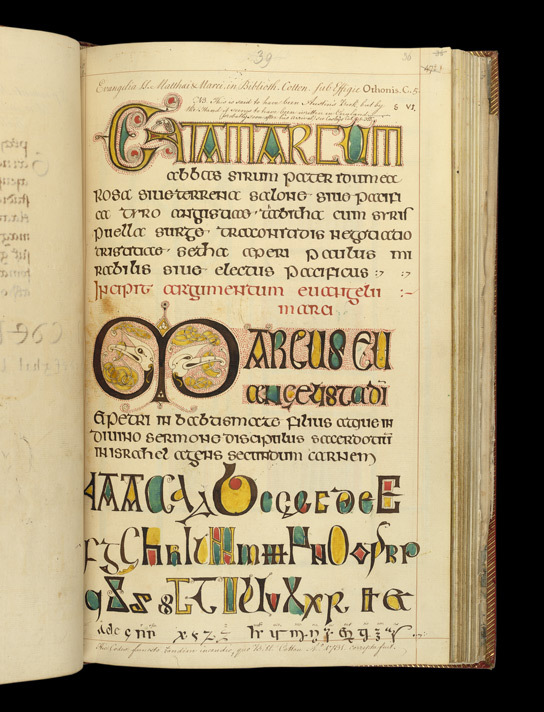 [**] As we approach the twenty-first century, there are an ever-increasing number of reasons to wish to photograph manuscripts, and, it would seem, an ever-decreasing number of opportunities to do so. The scholar’s needs for precise recordings of texts, images, scripts, inks, pigments, layout, and surface features are countered by the conservator’s and curator’s cautions against exposing manuscripts to further potentially damaging light, photographic conditions, and handling. Particularly given the wide range of public and private collections around the world containing manuscripts, and their varied conditions of ownership, funding, staff, and access, there can be no single straightforward answer to this constant tension between the demands of examination and preservation, which can be both equally valid and mutually exclusive. My own experience over a number of years as a manuscript scholar and as professional manuscript photographer, particularly as in-house photographer at the Parker Library of Corpus Christi College, Cambridge, and for the Research Group on Manuscript Evidence, teaches me that the materials and techniques available to the professional photographer can — in the hands of a scholar skilled in handling manuscripts — overcome many of these challenges. Not all manuscript scholars will have the need of obligation to develop such photographic skills, of course, but it can be very useful to expand one’s awareness of the problems and potentials of manuscript photography. [**] Photography is particularly suitable for recording the actual state of a manuscript. It surely beats copying by hand, like the many pre-photographic facsimiles made by or for antiquaries, scholars, and bibliophiles, as with the colored printed plates made for James Goodwin by 1847 from Corpus Christi College MS 197B, the Cambridge portion of the Cambridge–London Gospels now divided between Corpus and the British Library. Here are reproductions of its eagle evangelist-symbol page of the Gospel of John, with Goodwin’s plate on the left and my 35-mm color slide on the right, taken six years ago. We would probably all agree that the photograph offers a more satisfactory record of the original, although the facsimile has its own fascination. [**] Yet not everyone would believe that photographs could substitute fully for the original, even with the lavish full color facsimile of the Book of Kells, a close relative of the Cambridge–London Gospels. This facsimile, published in 1990, sometimes goes so far as attempting to imitate the wormholes by holes in the paper. © The British Library Board. Stowe MS 1061, folio 36r. Reproduced by permission. [**] and Goodwin’s plate of the John initial-page from MS 197B, before trimming in the rebinding of 1953 removed some of its top. Such reproductions perforce assume the stature of primary witnesses. More generally, photography can enable the material to be made readily available to scholars and others in a variety of centers. It can reduce the need for handling the manuscript itself, either by eliminating the need or by permitting preliminary study before actual consultation. It can demonstrate features which cannot be seen under ordinary circumstances. [**] For example, using high-powered microscopic photographs, small details of ink, underdrawing, pigments, and other features can be captured. Ultra-violet or infra-red illumination can reveal differences in inks, traces of former passages left within erasures, or parts which have otherwise faded into invisibility. Oblique or transmitted lighting can highlight some surface features, such as underdrawings or scratched drypoint glosses. Photographs are an excellent way to record features which would be difficult to describe; to register states in the process of change; and to preserve and demonstrate evidence of multiple kinds. [**] To indicate some of the different applications for photographs, I have chosen examples from Corpus Corpus Christi College, Cambridge, MS 23, a magnificent illustrated Anglo-Saxon copy of works by Prudentius made in the late tenth or eleventh century. In the course of full-time research on the Anglo-Saxon and related manuscripts at Corpus Christi College over the past seven years, I have had occasion to photograph it for a wide variety of purposes, notably during its major conservation and rebinding in 1987–8. The purposes include preparing color prints of full pages at actual size for study, exhibition display, and reproduction; and color slides ranging from whole pages or openings with facing pages, to details of script and images. Here are a color print at actual size [SHOW]; and a slide on the left of the first page of text, which opens Prudentius’s preface to the Psychomachia. It contains text, glosses in the interlines and margins, a major decorated initial S, and an illustration within a rectangular frame. [**] Here are details of the illustration, with its Old English title and drawing in colored outlines by a master artist. 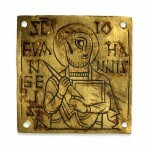 [**] Photography is an important tool for recording manuscripts before, during, and after conservation. Disbinding a manuscript offers an ideal time to photograph, when the individual leaves, whether single leaves or bifolia, can be seen in full, and without the curvature imposed in a binding, as on the right, where the bifolium comes from an outer portion of a quire of nested leaves, with folio 104 recto on the left and folio 91 verso on the right, so their texts are not consecutive. 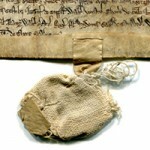 [**] Photographs can record features which disbinding may uncover, and which rebinding will render inaccessible again, as in the gutters or spine-folds of the leaves, where the stitching patterns of former bindings remain, as well as any script or decoration which comes close to the gutters, as here. [**] and elements are removed from the leaves, to be moved to other parts of the volume, as with this lifted slip which now stands on its own at the front. [**] Series of details can focus on specific elements, to illustrate aspects of the manuscript, its origins, and its history. For MS 23, we have found it especially useful to document the stratigraphic features which reveal the complex process of production, involving a team of scribes and the artist working in tandem. For example, here the gloss in the upper margin overlies part of the decorated initial, showing which came first. 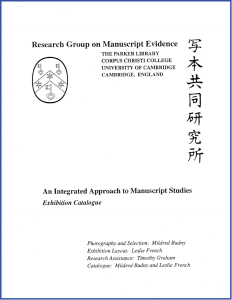 Here, on the right the outline of the frame interrupts its course for a rising gloss. Pointing to such evidence at a great distance from the manuscript can enable others who have never seen it, or have not seen it recently or in such a light, to observe the evidence for themselves. Such photographs can present the case for the sequence of production, rather than having to leave it open to faith from hearsay alone. 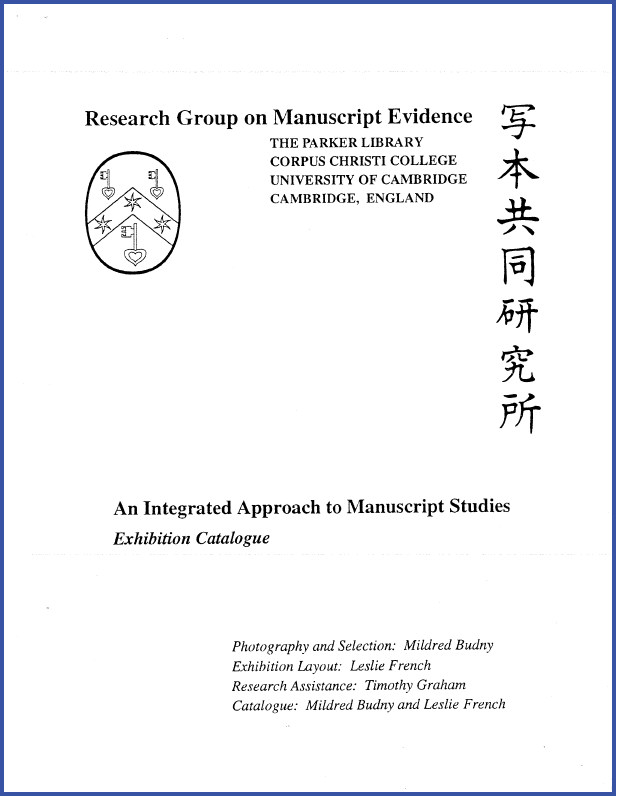 [**] Even in the presence of a manuscript itself, photographs from it or its relatives can be invaluable in its study. Photographs make it possible closely to compare features which normally cannot be seen at the same time in the flesh, such as those which stand on distant pages in the manuscript, or on both sides of a single leaf; and also to compare its features with its relatives. For MS 23, this made it possible to establish that the decorated initial which opens the book was drawn by the artist of the illustrations, by observing the precise forms of rendering similar features, like these wigs of a bird in the initial and angels in the illustrations. [**] Moreover, we can compare the eighty-nine illustrations, of which another one appears on the left, with works by the same artist in a manuscript in Oxford, the Junius Manuscript of Old English Poetry, shown here on the right. [**] Photographic applications extend from slides and larger-format transparencies to prints in black-and-white or color, for a variety of purposes. Procedures range from copy-photography to microphotography and enhanced imaging. Photographic materials, equipment, and techniques cover an extremely broad range. The subjects range from tightly-bound volumes of many sizes to fragments and disbound leaves. The circumstances encompass conditions of access, needs of security, safe and suitable lighting, proper handling techniques, and appropriate expertise. [**] In some manuscript collections, specialized photography can be made with equipment of various kinds. For example, at the British Library, photographs can be taken from the screen of the Video-Spectral Comparator, which permit viewing books with a variety of filters, including both Ultra-violet and infra-red filters. These slides are by Tony Parker of the Conservation and Preservation Directorate of the British Library. Other specialized equipment and techniques include microscopy, boroscopy, endoscopy, and video. [**] and MS 201, where part of the rubricated title has been scraped, leaving only a few parts of letters, which enable us at least to rule out some suggested readings. [**] Pages damaged by exposure while unbound, as on the left, and by holes and burn marks from the rusted metal mounts of a former binding penetrating the leaves at the front of the book, as on both left and right, from MS 422A, a copy of the Dialogues of Solomon and Saturn. [**] Pages damaged by chemical reagents applied to the surface in a misguided attempt to enhance the inks of faded passages, as in the same manuscript on both left and right; and palimpsests, with one text written over another, as on the right. [**] Liquid damage, notably “ink lakes,” where liquid has run across or down the page, leaching the ink to the shores or tide-lines, as in MS 173A on the left; and liquid immersion, where much of the ink has dissolved away, leaving only faint traces, as in MS 173B — the eighth-century Corpus Sedulius — on the right. [**] Drypoint glosses, notably where occurring in superimposed layers, as in MS 173B, which has received heavy use as a teaching text. [**] Passages affected by corroded pigments and show-through, as in the monumental title-page which opens MS 23, on which the original text in metallic red pigment has darkened to black, while the alterations in vegetable red pigment have retained their bright color, rendering the two stages distinguishable at a glance. [**] Corroded metallic pigments which have faded into near illegibility, as in many rubricated lines of script in MS 422B, the Red Book of Darley. [**] Elements added or altered in different inks, as in MS 12, the Corpus Old English Bede, where the tenth-century original text of King Alfred’s prose preface has much added punctuation and glosses, with the additions entered mostly by the thirteenth-century “Tremulous Worcester Hand” and a few by the sixteenth-century scholar John Joscelyn. Here we have been able not only to isolate all the additions from the original, but also to attribute all the additions to one hand or the other, through detailed examination of this kind, combined with research on the habits of those hands in other manuscripts. Needless to say, such slight differences in color and texture of ink would not be conveyed so well in a black-and-white photograph. Such photographs embody our aim to show the evidence in manuscripts, rather than merely asserting what we think we see there. Thus we invite others to examine the material, and help advise or revise the interpretations. 1. Preparing archival records and reproductions for publications. 3. Recording changes of state, as in conservation work or acquired damage. 4. Registering the importance of color in the original, in pigments, inks, and surfaces. 5. Enhancing or revealing surface features, as with scratched glosses or sketches. 6. Using Ultra-violet, infra-red, and other advanced forms of photography, to reveal elements otherwise invisible. 1. The threat of damage to the original by flash or constant high illumination and heat. 2. Possible damage to the leaves and bindings by flattening for photography, in an attempt to expose more features which a tight binding may restrict, or to reduce distortion of the image on the flat plane of the film. There have been very many cases, alas, of manuscripts severely damaged in the process of filming and microfilming. This is due to ignorance. 3. The considerable time, effort, and expense of producing, labeling, storing, and cataloguing negatives, slides, prints, and transparencies. 4. The expense of suitable photographic and lighting equipment itself, as well as the space which it may require for storage and use, let alone transportation from one site to another. 5. The need to track down the use — and mis-use — of reproductions and copyright agreements. For the last two problems, which belong to financial and administrative domains, I can offer no ready-made solutions. My own solution to finding the right equipment and materials myself over the years, including a range of specialized equipment for a variety of applications; and to search for funding for the photographic materials, developing, and printing, all of which takes much time and effort, although I believe the results are worthwhile. Not every manuscript scholar or collection might have this option or obligation. As for addressing the conservator’s worries, we can use emerging photographic technology in combination with an increasing awareness of, and sensitivity for, conservation requirements. I shall consider only the “traditional” film techniques, as other speakers in this session will be describing computer-based methods and computer equipment. Although few would doubt that computer methods require the appropriate technology, there are still many who do not see that professional-quality photographs REQUIRE professional-quality equipment, materials, and expertise. Snap-shots are one thing, and they have their uses, but quality photographs are another thing altogether. For example, professional half- or full-plate cameras (using medium- or large-format films) allow the angle of the image-plane to be varied, which compensates for the overall non-linearity of the manuscript page, as where it slopes or cannot be laid flat or completely flat. Also, these can reduce the need to press pages flat when photographing. Alternately, increased appreciation of manuscripts as artefacts can enable scholars and others to accept photographs which show the undulations or so-called defects in the manuscript as a faithful record, rather than seeking a cosmeticized or supposedly “improved” image. A major argument against manuscript photography is often the high level of lighting, which can mean bringing very hot lights close to the pages. The effects of Ultra-violet photonic shock from flash photography are as yet only partly known. Yet here, too, professional equipment can ease these difficulties. Studio-lighting, with tungsten or daylight-rated bulbs directed AWAY from the manuscript reduces the level of constant illumination, while cold fibre-optic lighting, with cables of various diameters, offers another important conservation-friendly source of illumination. The latter also permits enhancement of certain features through transmitted or oblique lighting. For studio-lighting, reflector umbrellas, correctly placed, both give even lighting on the subject AND eliminate Ultra-violet light, which passes straight through. Also film-technology itself is changing rapidly. Our Research Group contacts with professional suppliers allow us to keep track of developments in film emulsions and processings. For example, following our workshop on imaging techniques for manuscript studies in January, we are currently evaluating the new Fuji “Velvia” range of professional film stock, which offers quality comparable to Kodak Ektachrome, yet with standard laboratory processing. This is of particular interest, because the manuscript photographer’s job should not end with shooting the roll of film. [**] It is our job to help produce the best FINAL produce, be it slide, print, or publication. 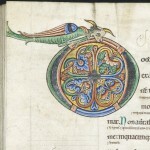 This means ensuring that when photographing the manuscript, the appropriate scales and guides are included within view. Linear scales in inches or centimeters, as at the left beside MS 326, give a guide to the scale, and enable precise printing to actual size or to a specific degree of reduction or enlargement. Grey-scales for black-and-white photographs, and standard color-guides for color photographs, as at the right in combination below MS 23, permit the developing and printing to be closely monitored, and adjusted for accuracy. The work even extends to ensuring that all the rolls of film for a given manuscript or tsk come from the same factory coating-batch; that they are stored at the proper temperature before and after shooting; and that they are processed in exactly the same way, ideally at one stretch and with the same bath of chemicals, with test rolls to check and correct at the different stages. For all this we HAVE to use a professional film supplier and processing laboratory. All these considerations, when taken into account, work to make the best, and safest photographic record possible. It is rarely, if ever, possible, in the great manuscript repositories around the world (and certainly not at Corpus Christi College), simply to “pull out a camera,” press the shutter, and hope for the best, just like that. It takes much careful preparation, care, expense, skill, and co-ordination. In other words, manuscript photograph can be no snap decision! Update. Much has changed since 1994, it goes mostly without saying. This paper reads rather like a time-capsule buried within the walls of a city to return once more to the light of day for inspection, introspection, and a sense of wonder about what used to be necessary, when wishing for photographic records of manuscripts as aids to memory and as tools for study and research. Particularly for “souvenirs”, momentos, and visual records capable of being viewed elsewhere than in the one place and time(s) wherein inspection of the original is or might be possible. Mildred Budny has continued to engage in manuscript photography for various purposes and with various equipment, digital included. For example, see our Photographic Exhibitions & Masterclasses. And various pages on our updated website, capable of containing images (2014–), carry her photographs, including some posts in our (or her) blog on Manuscript Studies, which has a convenient Contents List. Also, her lecture in November 2010 at Princeton University confronted additional challenges posed by the proliferation of digital images without instruction in perceiving them more clearly for what they can and cannot show, so as better to recognize their standing alongside and against the originals in other media. Just to mention. 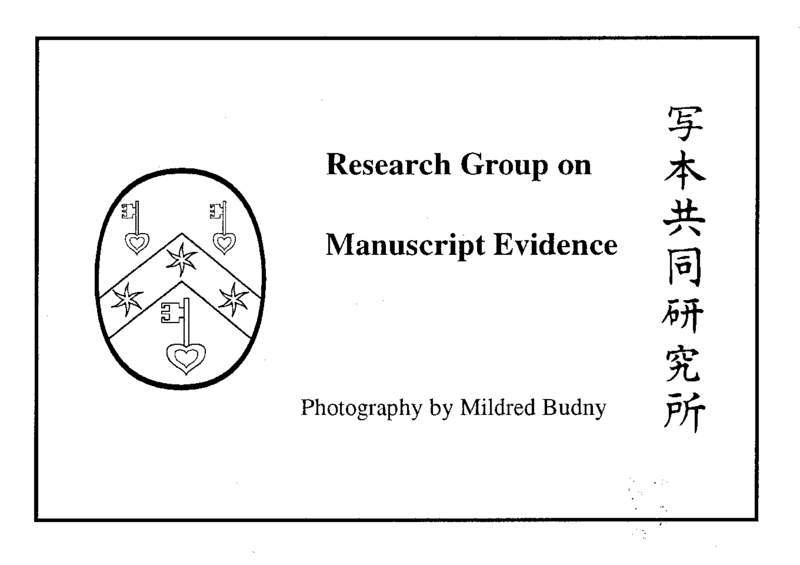 Some of the manuscripts mentioned in the 1994 Congress Paper were the central subjects of individual Seminars or Workshops in the Research Group Series on “The Evidence of Manuscripts”, organized by Mildred Budny and held mainly at the Parker Library. 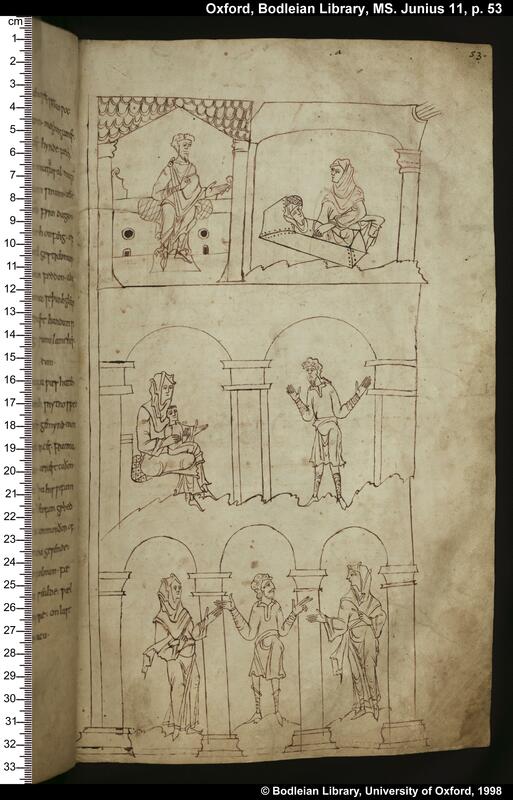 Also, most of the manuscripts mentioned in the 1994 Congress Paper are included in the 2-volume Illustrated Catalogue of Insular, Anglo-Saxon, and Early Anglo-Norman Manuscript Art at Corpus Christi College, Cambridge. You know (now) that all 747 pages of its black-and-white plates and all 18 pages of its color plates, including the frontispieces, display her photography of the manuscripts, made afresh for this publication. You might own your very own copy. See our special Promotional Offer.